The M20 throttle position switch (TPS) is notorious for failing. Chances are, you are driving around right now with a failed TPS sensor and don't even know it! Because of BMW's poor placement, under the throttle body, it is prone to failure and you probably didn't even know it was there. A failed TPS robs your E30 of it's natural power. It simply prevents you from realizing the full potential of your car! Because BMW placed the M20 TPS on the bottom of the throttle body, it is prone to collect moisture and oil. This leads the sensor to short out and die prematurely. The throttle shaft extends into the sensor and is responsible for the moisture and oil trickling down into circuitry of the TPS. 9/10 times these sensors are bad and the customer doesn't even know it. 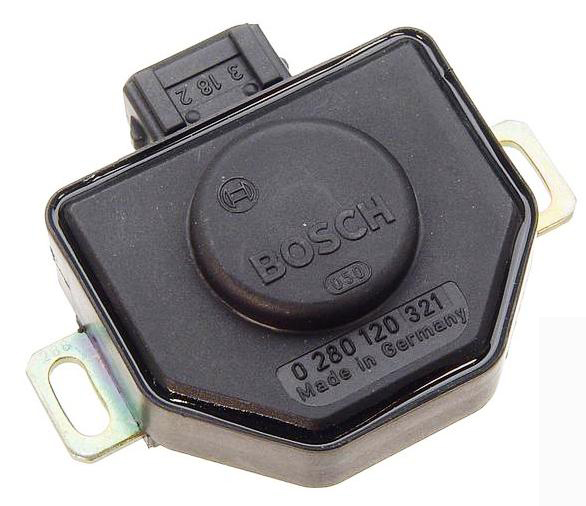 The TPS is responsible for telling the ECU where the throttle position is. The ECU has three main fueling maps. Idle, partial throttle and full throttle all have their respective map. The TPS triggers the ECU to use the appropriate map. When the TPS has failed it does not trigger the full throttle maps. Even bone stock, the full throttle maps provide an improvement in power and performance. So a failed TPS simply robs your from power your engine is capble of making natually. The problem is compounded when the full throttle maps have been further recalibrated for performance. You car simply isn't using them and won't performance to its potential. A quick test is all that is needed to verify if your TPS is working.